Hi Obachan! Looks delicious. Getting windy there? Here is only slightly windy, but is raining. I guess in Osaka we are lucky that Shikokku blocks most of the typhoons, although this one seems to be heading this way. Stay safe! I just got back from the post office... I walked through the rain and the wind. The storm is not extremely terrible here yet, but getting worse. My herbs are in the bathroom now.Yeah, I'll try to stay safe, thank you. And same to you, too. I feel sorry for you guys down in Shikoku. Hope you are all safe. I have never experienced a typoon before in my life. We have no extreme weather here in Vancouver. Just very hot and dry up to 30 degrees! 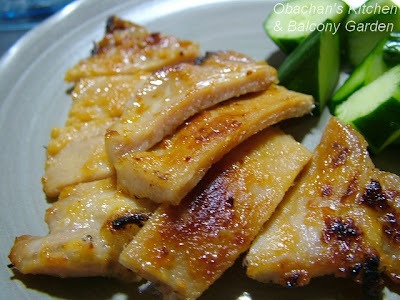 Love your pork marinated in miso. Did you use red or white miso? I'd like to try it myself. Ooh, misozuke pork, I've never had pork this way. I'm having shogayaki tonight. I hope the electricity stays on for you, candlelight might be fun, but no a/c would not. Stay safe. A nice dish! That pork looks yummy! Thanks. We servived with no serious damage in my neighborhood. As for miso, I used regular miso, but white miso would be safer, I guess. Hi. Typhoon was not as bad as I had thought. We expected it to land on my hometown, but it oddly avoided the Muroto cape. Ah! Shogayaki. That's my favorite dish, if not the most favorite. I have to post about it sometime this summer. Yeah, now they are safely put back on the balcony. I REALLY hope that I don't have to do it too often this summer (but looks like we are going to have more typhoon than last year...). Sure would appreciate a recipe!